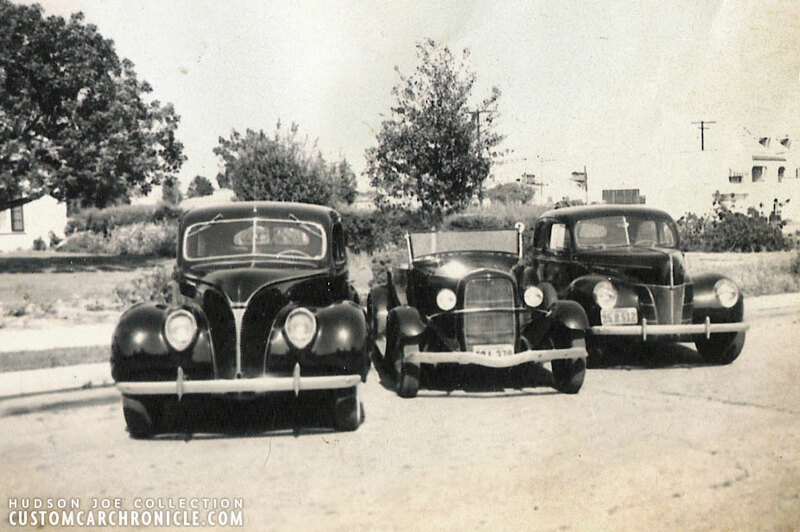 Harlan Frazier owned some pretty nice rides in his life. 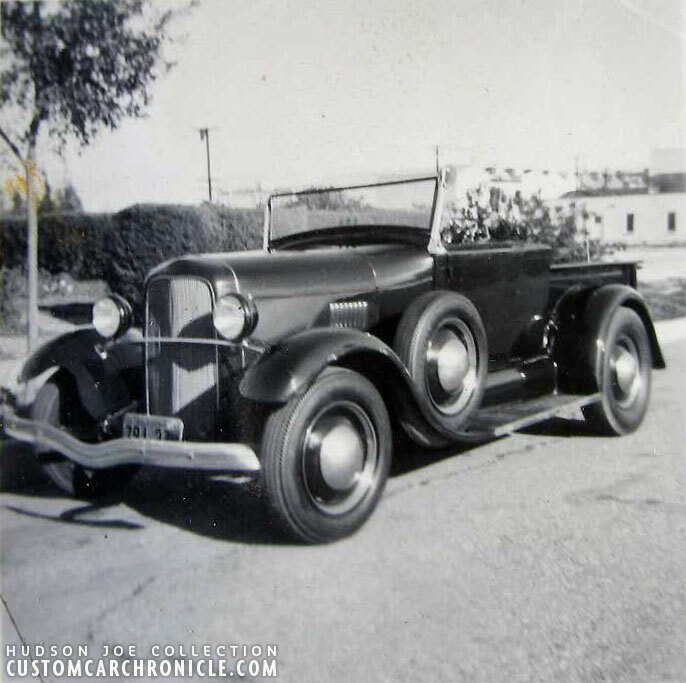 For this article we concentrate on his Model A Pick Up. Thanks to Hudson Joe for sharing his collection. 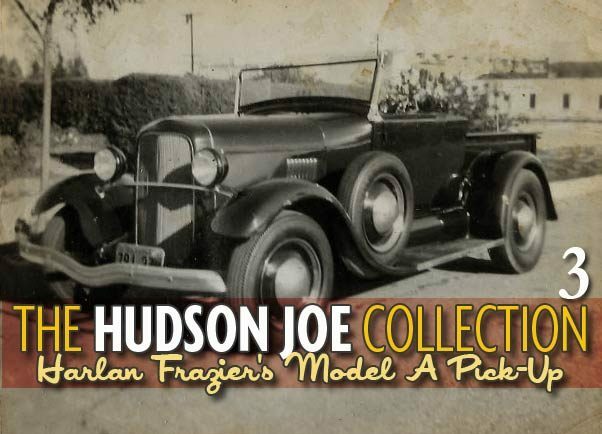 The Hudson Joe Collection Part 3. 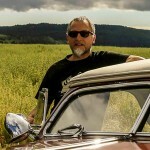 Hudson Joe from California has a passion for old things and historic photos of Hot Rods and Custom Cars. He has been collecting these photos for many years. Fining them at estate sales, swapmeets and just finding them in the trash. 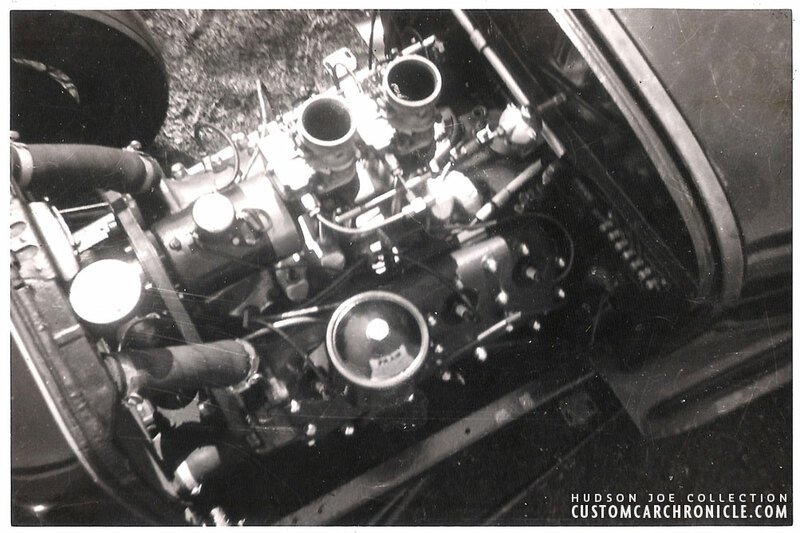 Joe also got a series of photos from some of the old Hot Rodders he knows. One of them is Harlan Frazier, aka Mac Frazier, an old Hotrodder from Burbank, California. 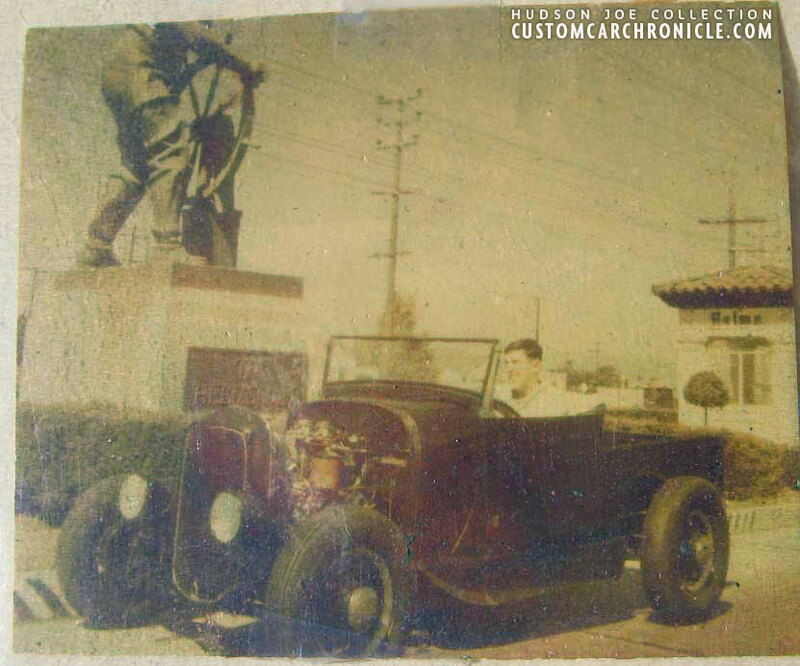 Harlan owned some cool Hot Rods and Custom Cars in the 1940’s and 1950’s, and he became good friend with Joe. Harlan will be 90 this year (2016) and he gave his collection of photos to Joe, because he knew Joe would appreciate them much more than anybody else he knew. 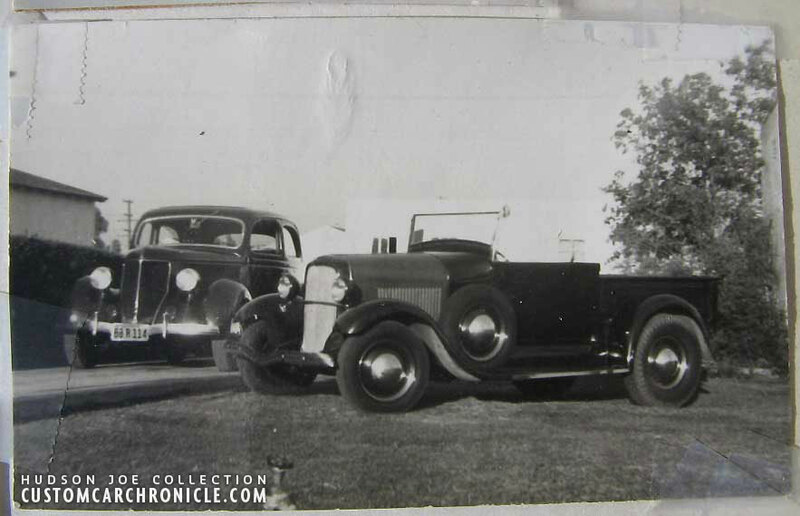 For this third article on the Joe Hudson Collection we concentrate on some really great photos of Harlan’s Hot Rod Pick Up he owned in the late 1940’s early 1950’s. 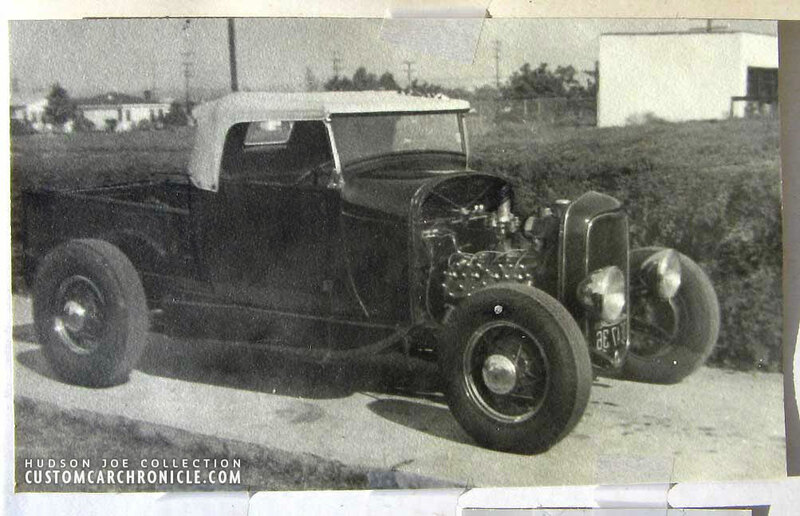 An 1928-29 Model A pick Up truck Hot Rod that changed quite a bit over a period of several years. 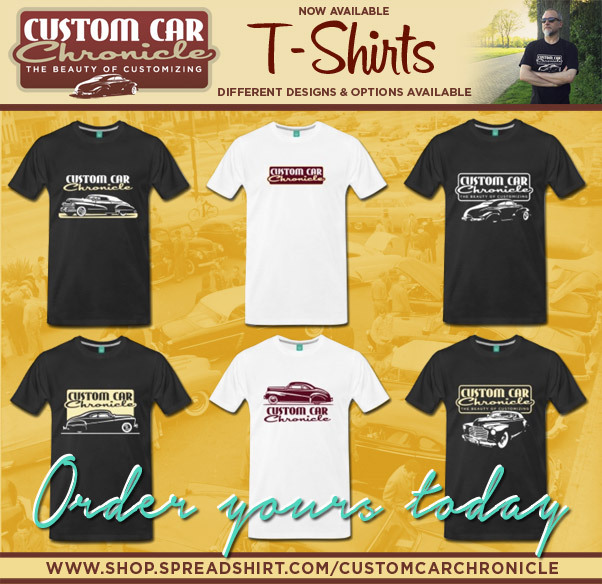 From a wild fender less and hood less Hot Rod with wire wheels in the early 1940’s to a more subtile, very well proportioned full fendered Hot Rod in the later parts of the 1940’s. At first an older rear portion of the pick-up boy was used with the more sweeping back. 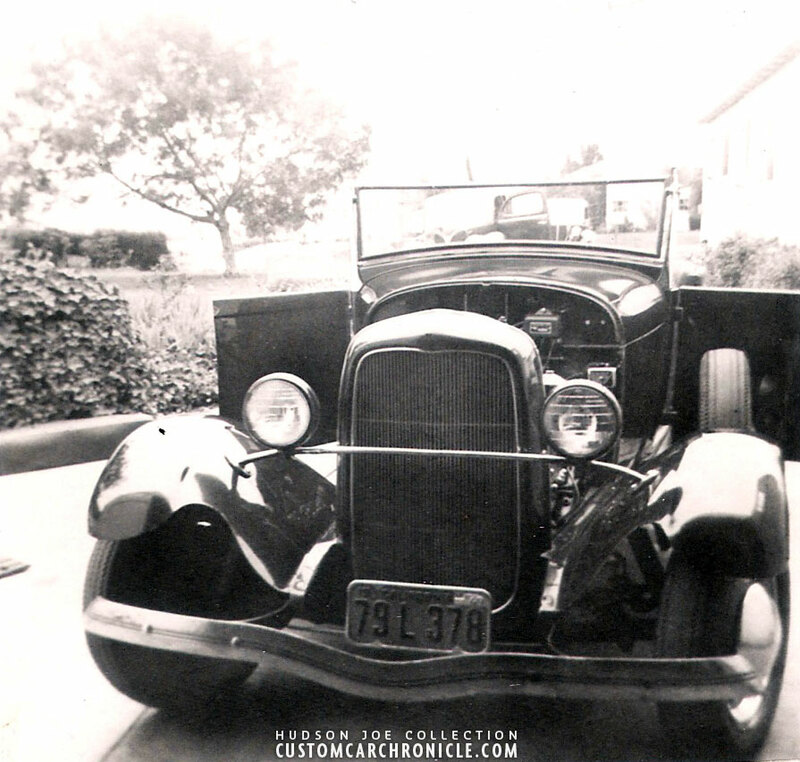 Later a ’29 Model A squire type back was added to the car. 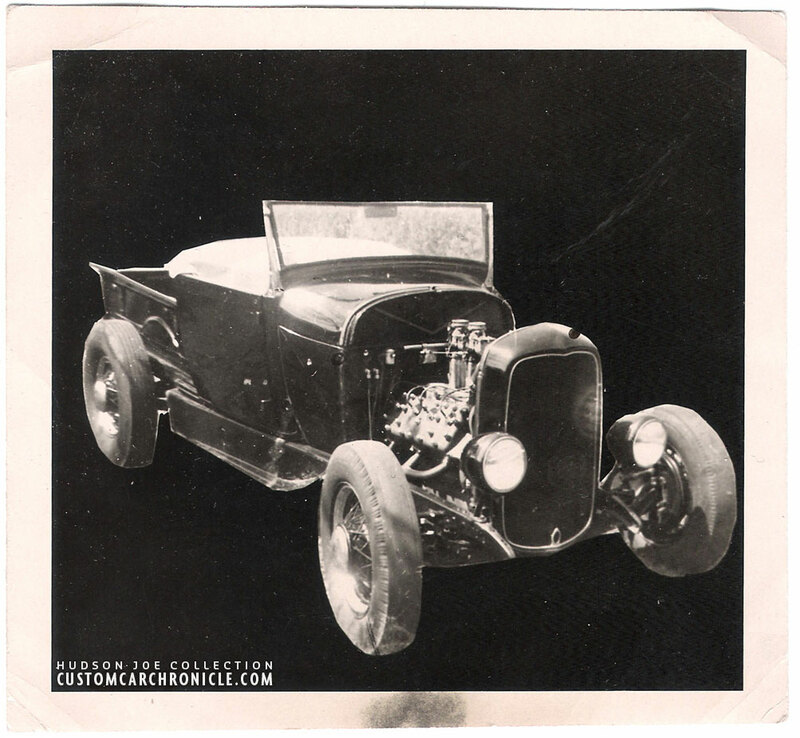 Harlan loved to take photos and experimented with his Hot Rod and Custom Car photos for several school projects. 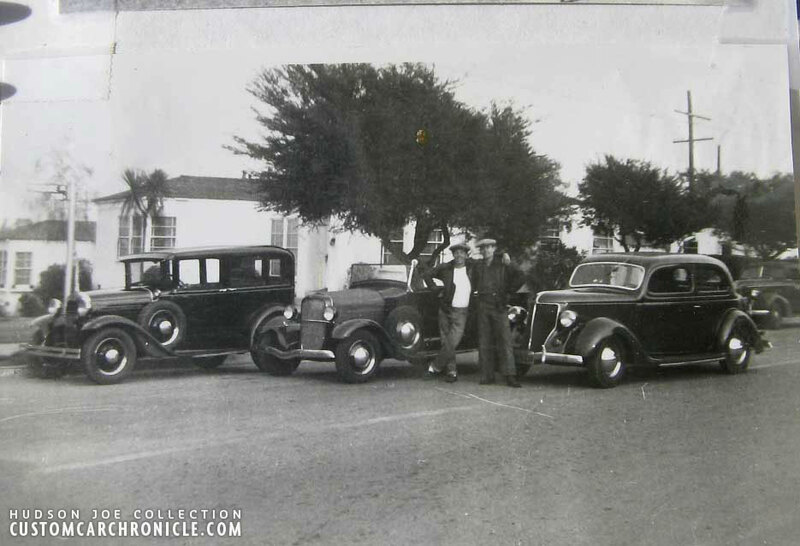 We are very glad he took so many photos back then, to give us a great look at the cars from the Burbank California area in the 1940’s and early 1950’s. 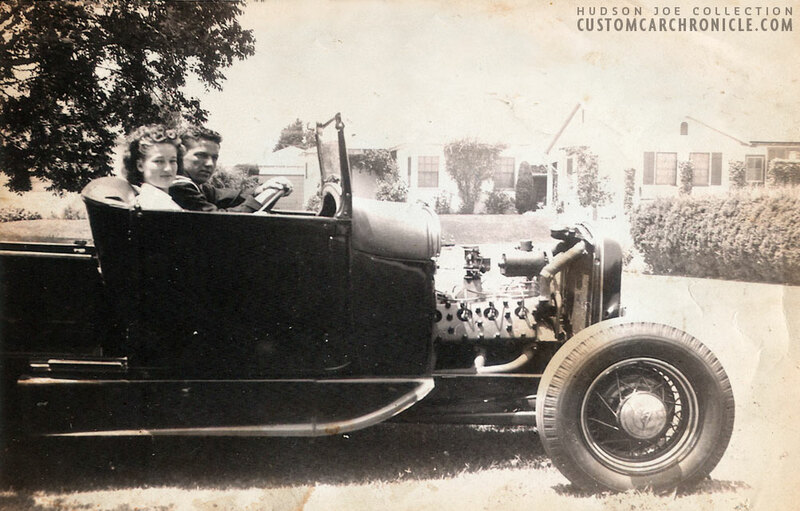 Harlan and his future wife in the roadster. 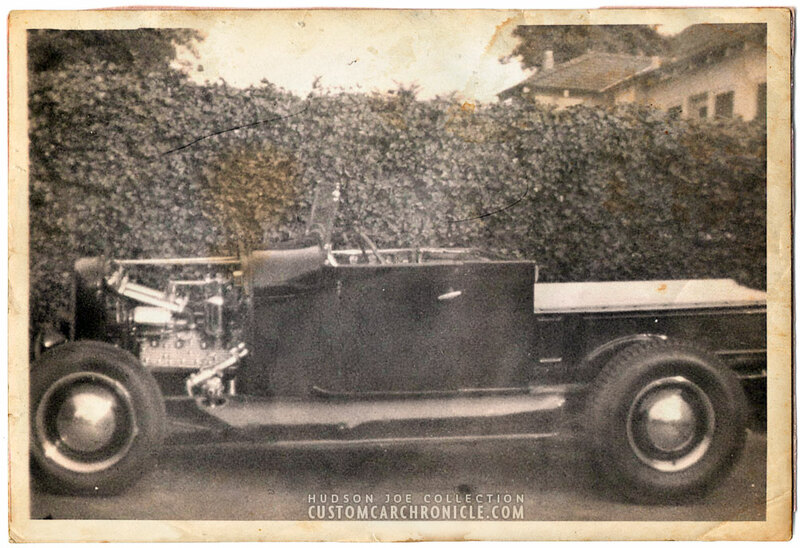 Even though the fenders were removed the side panels remained on the car. 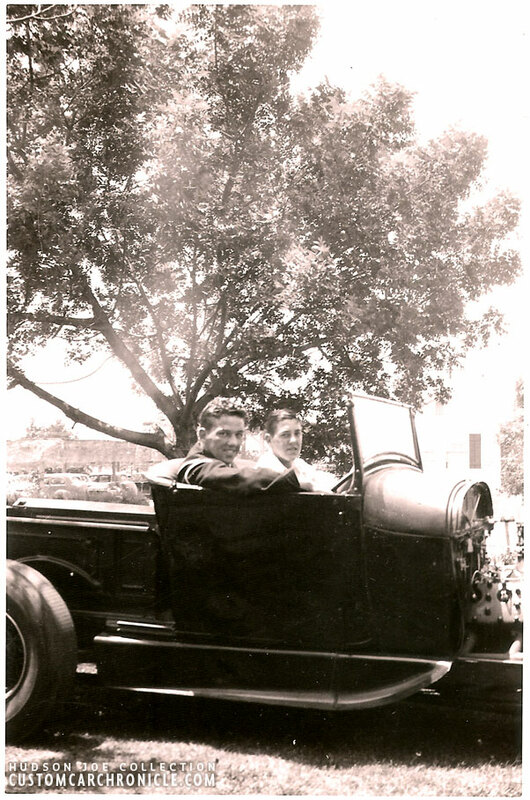 Harlan on the left and his brother behind the wheel. 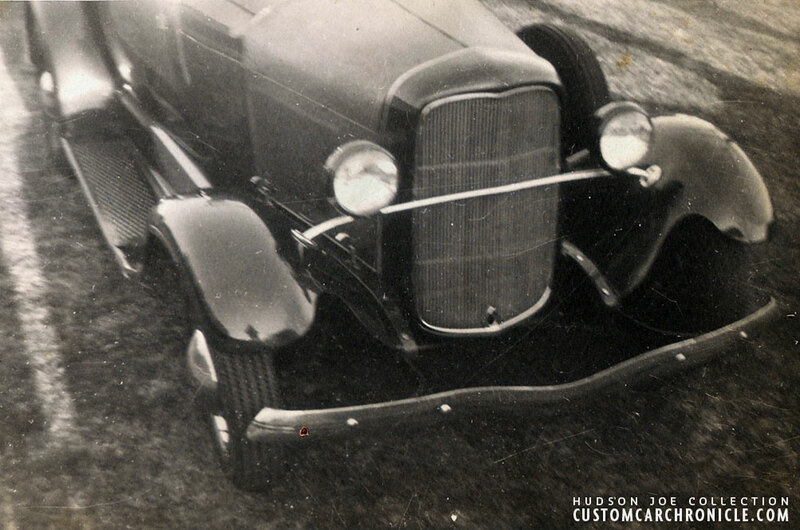 Harlan chopped the windshield and added a ’32 Ford grille. Notice how this photo was mirrored by mistake. The same negative was used for this print, another school experiment. 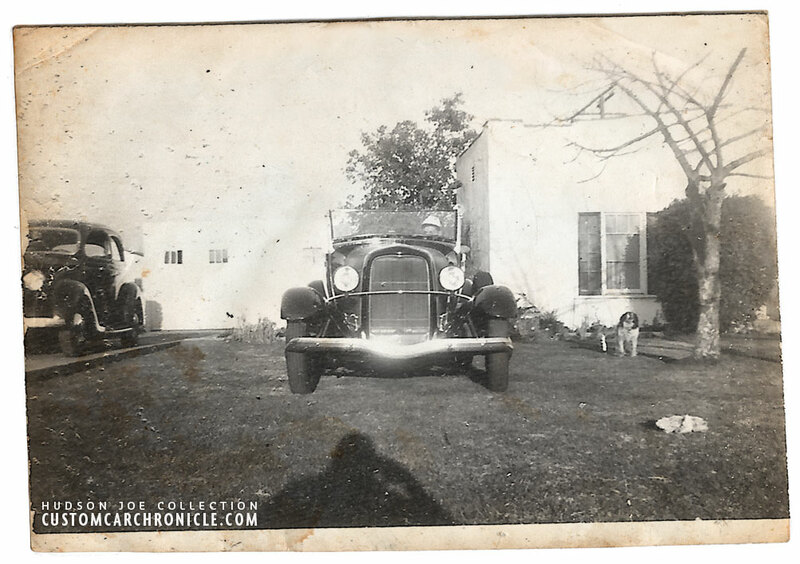 Only one, very much faded color photo is left of Harlan’s Pick-Up. 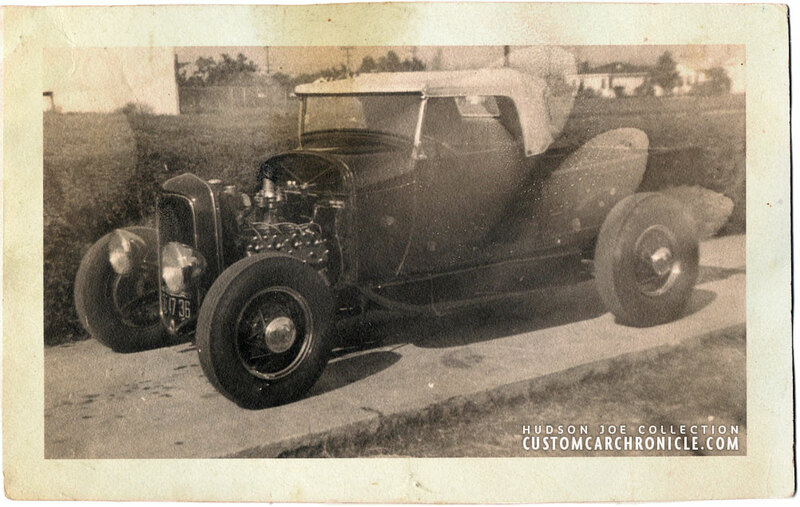 This pic of the roadster pick up with a black background was another of Harlan’s photography class project. He took a ton of pics and added funny stuff in the back ground. Full fendered and a stock hood and a fresh coat of primer. 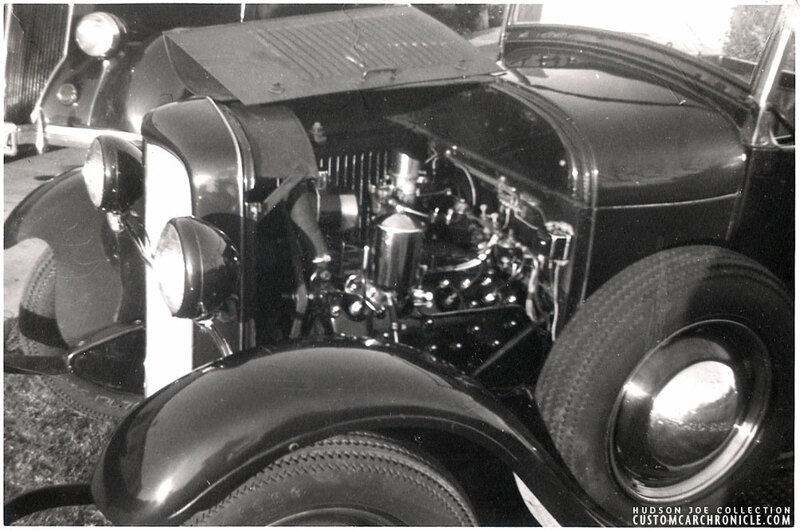 Harlan also replaced the wire wheels with 1940 Ford steelies with 40 Ford hubcaps and beauty rings. 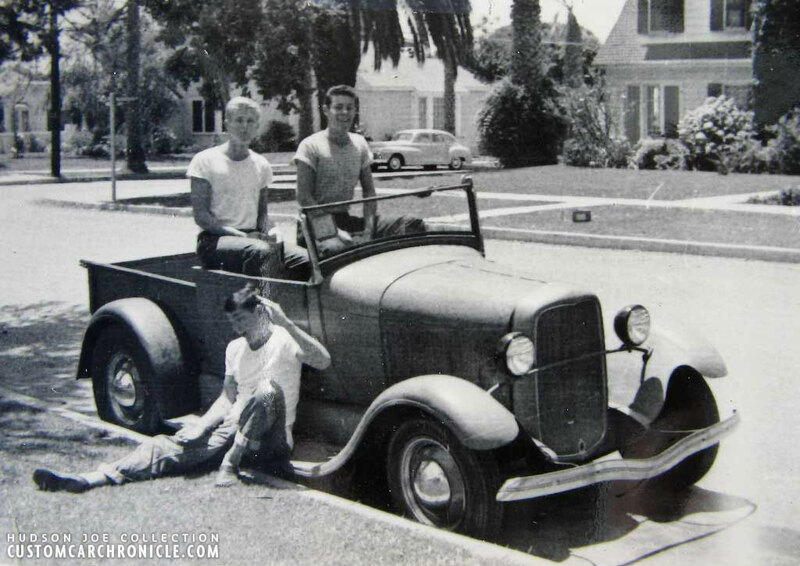 The three guys in the roadster are Harlan his brother and good friend. Harlan’d pick up os now mostly painted, except for the hood, which he planned to modify. A friends mild ’36 Ford sedan is parked next to it. 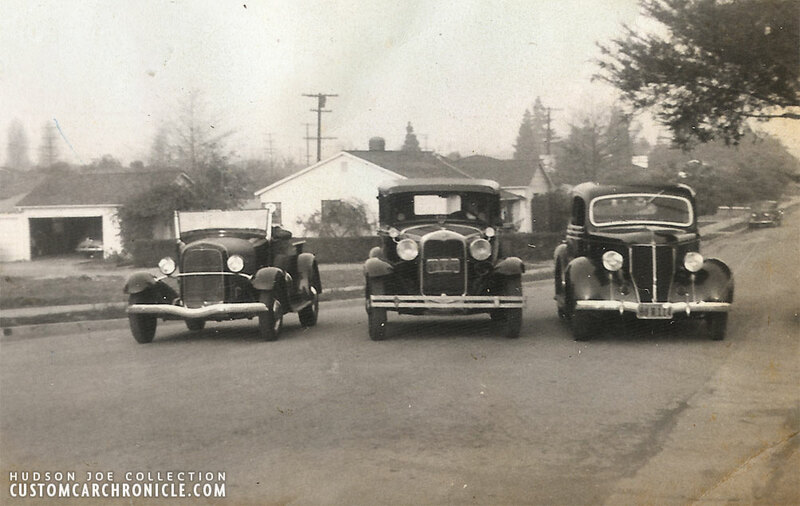 Harlan’s pick up with to of his friends cars in the late 1940’s. Side mounted spare tire also has the ’40 Ford Deluxe hubcaps. The engine has been nicely detailed and some chrome goodies have been added. 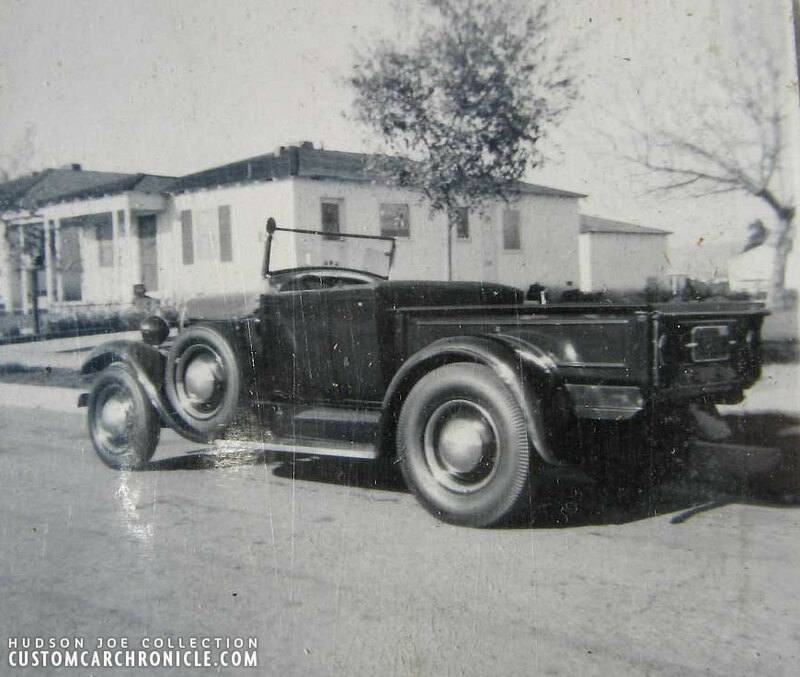 1949 photo show the car when work was done on the hood and after Harlan added the license plate to the front. Harlan’d Pick Up in good company. The Pick Up was completed later in 1949 with a one pice hood top, and modified sides. The pick up looked really stunning. The big & little black wall tires and a dropped front axle gave the car a perfect stance. 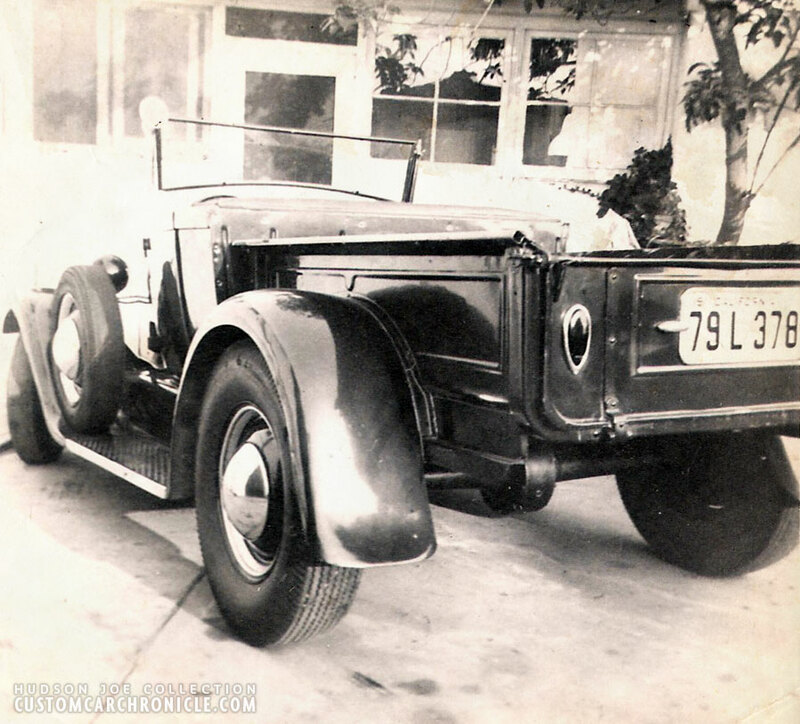 Harlan mounted the license plate on the tailgate, and on each side he added 38-39 Ford teardrop taillights. He did not use a bumper on the rear. Harlan also took a picture of this good looking very similar pick up as his own. This one has a differnt flathead engine with some nice chrome goodies. Now here is “back in the day”. Thanks, Hudson Joe.